Cooking enough for an army has been a long established tradition of Jewish mothers across the globe, but mine takes it to a new level. I can’t think of a meal prepared by my mother where there wasn’t enough food for each diner to have second or even third helpings. In fact, guests know that if my mom is preparing a festive meal, they most certainly should arrive hungry. This, of course, is no accident. As an immigrant who suffered great hardships in her native land of Cuba, my mother’s biggest fear in life is not having enough food. One look at the luxury of an American supermarket where there are aisles upon aisles stocked with countless varieties of culinary offerings, you’d think that fear would be quashed. However, this deeply rooted concern reflects less on the abundance that is available in the states, and stems more from her experience growing up in a third-world country, where she wasn’t sure if her next meal would offer enough to fill her then-growing belly. Regardless of its origins, the fact that my mom is known for cooking in abundance is good news for any of her guests, because you can be sure that she’ll send you home with some leftovers. Perhaps it’s because of this practice that I have become well-versed in the art of reinventing leftovers. As delicious as my mother’s cooking is, after the third night in a row of eating brisket, I find myself craving a bit of variety. 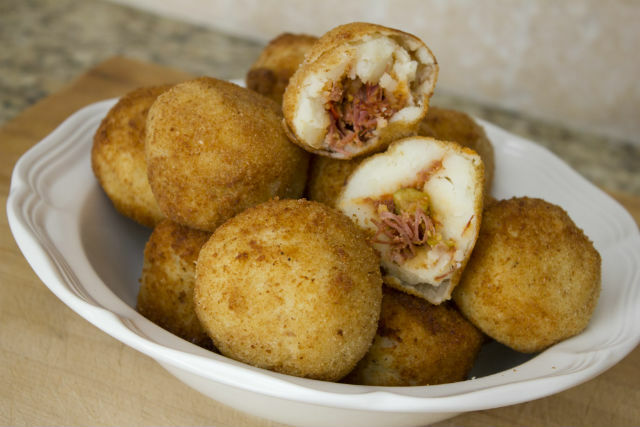 Papas rellenas, or stuffed potato balls, offer a great respite to the repetitive nature of leftovers, and are perfect for the second or third night of Hannukah. Like a perfectly baked loaf of crusty bread, the crunchy, golden fried crust of the papas rellenas leads the way to a soft and delicate interior, and the meat filling is the surprise within a surprise. 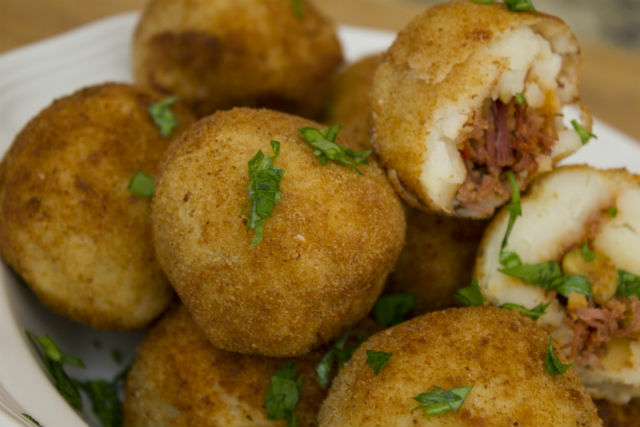 Traditionally stuffed with picadillo, or seasoned ground meat, papas rellenas can just as easily be stuffed with shredded leftover brisket, or any other protein of choice. 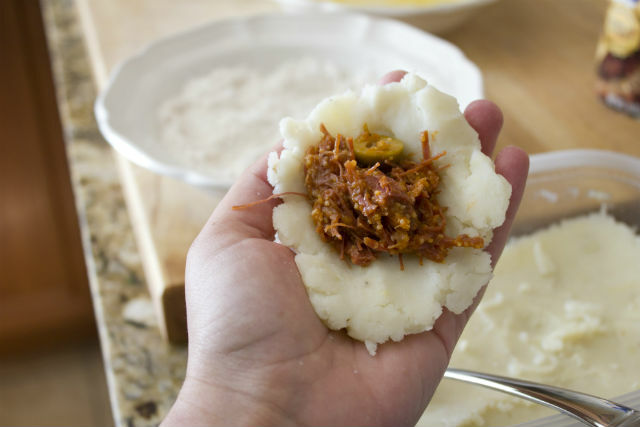 My favorite version includes the Cuban answer to brisket, Ropa Vieja, and will certainly be the highlight to your Hanukkah table or anytime you need a festive, fried finger food. Create a breading station by adding the flour, eggs, and breadcrumbs to individual shallow bowls. Place 2 heaping tablespoons of the cooled potatoes in your palm, and form a patty. Add 1 heaping tablespoon of the leftover brisket to the center of the patty, and use your thumbs to mold the potatoes into a ball, covering the brisket. Coat the ball in flour, shaking off the excess. Dip in the eggs, and then cover with the breadcrumbs. Set on a cookie sheet until all the potato balls are coated. Heat oil in a skillet to about 375 degrees, and fry the potato balls in small batches for about 1-2 minutes, or until golden brown and heated through. Transfer to a plate lined with paper towels.